“Can you recommend good vegan restaurants in Abruzzo?”, was an email recently received in the LifeInAbruzzo inbox. Dedicated ‘vegan’ and ‘vegetarian’ ones seem to come and go in the provincial capital towns and on the more touristy parts of the coast, but rather than spending time hunting out a dedicated vegan restaurant I would just walk in to one of the many excellent restaurants and agriturismo in Abruzzo and be surprised at how they rise to the challenge. More often than not the cook’s forebears would have been contadini (subsistence farmers) and their diet was mostly meatless depending on just how low their income was, so trust and dip into the history of the region to show you just how good Abruzzese style vegan food can be. 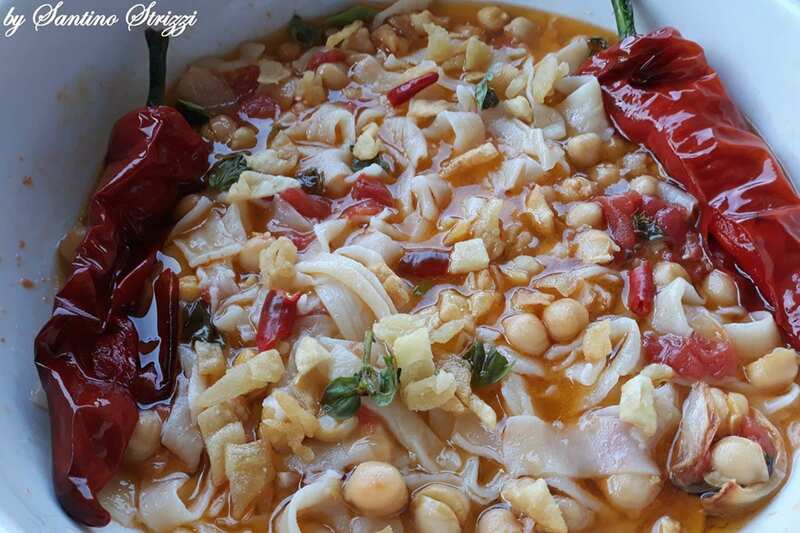 One glorious local vegan pasta dish you may like to try is a light sort of soupy pasta that is traditionally served with pulses, legumes and seafood. 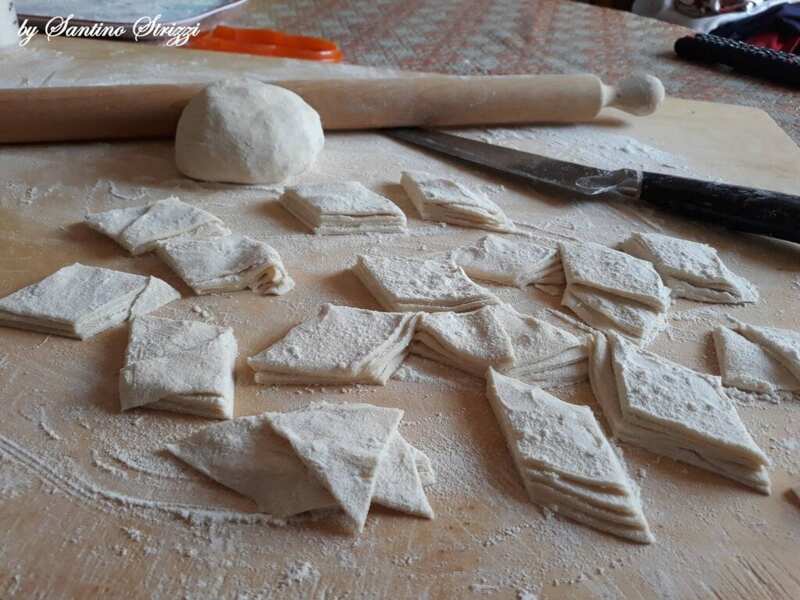 The pasta, Sagnette is essentially eggless pasta sheets made with 2 types of flour which have been chopped into smaller Sagnette (rectangular shapes), pèzze or a diamond shape known as tacconelle. 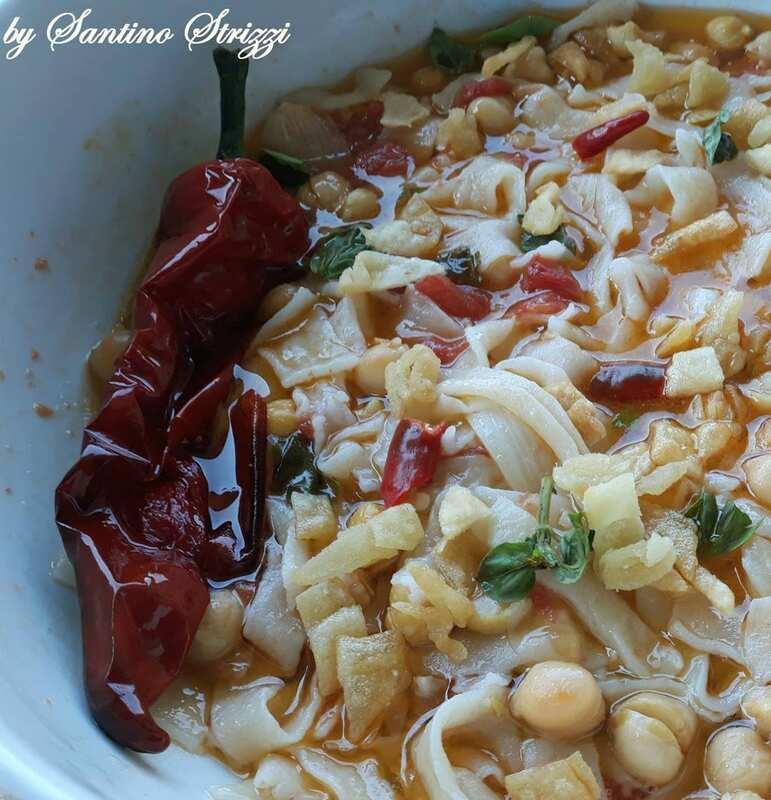 This ‘Sagnette, Chickpeas & Fried Sweet Chili Pepper (Sagnette e ceci con bastardone fritto) recipe by Chef Santino Strizzi caught my eye as he had fried some of the sagnette to give a little texture and he recommended pairing it with a young and fresh Cerasuolo wine. 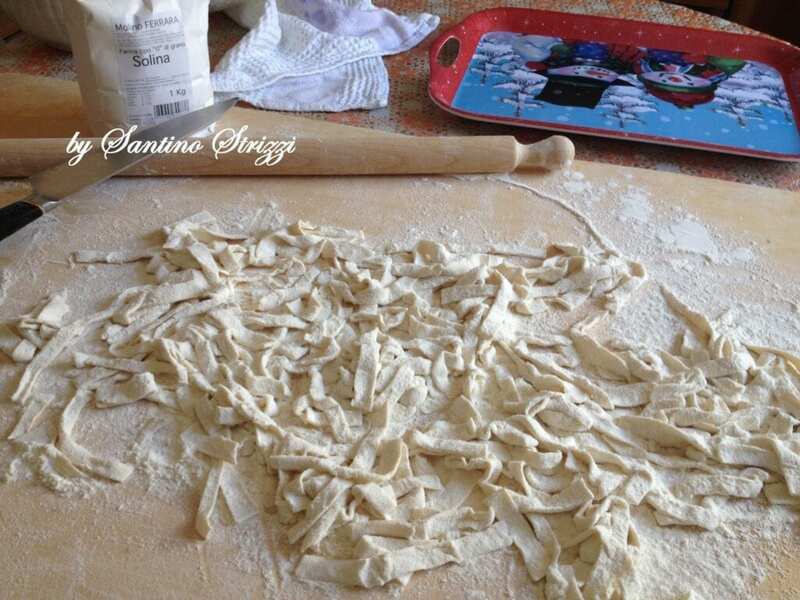 Chef Santino Strizzi is famous for his love of sagnette, he has a facebook group dedicated to this type of pasta, risotto, he has created almost 500 recipes and his extraordinary food carvings. 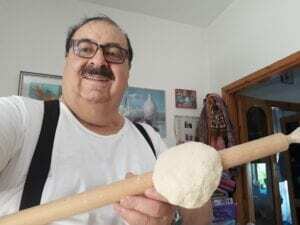 He still does pop up events in his dotage so do look out for him in Abruzzo or get some further inspiration from his Facebook feed where he frequently publishes weekly recipes. In a bowl mix the flour and semolina with salt and mix in a little cold water at a time, until you can make it into a dough. Roll into a bowl and leave to rest covered in the fridge. Roll out into rectangular sheets 3 mm thick and cut into mini 1 cm rectangle shapes. In a saucepan add a tablespoon of extra virgin olive oil and fry the sweet chili peppers (bastardoni) for a minute turning them. Take them out the oil and put them to one side. In the same pan fry 50g of the diced pasta for 2 minutes and then keep to one side. In a large saucepan, put the oil, finely chopped onion, thinly sliced garlic and celery and saute for 10 minutes. Add the cooked chickpeas including some of the water they were cooked in for another 10 minutes. Add the diced tomato, basil and chili and leave to sit for 10 minutes. Cook and drain the sagnette (retaining some of the water) and pour into the sauce and leave for a few minutes to stand. If the dish seems to thick add a ladel of the pasta water. Serve with a fried pepper and a spoonful of the fried dough in each bowl.